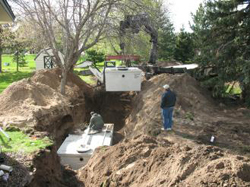 The septic system experts at Custom Septic Inc. install, maintain, and repair all types of septic systems all around Minnesota. We can help you determine the best septic system design for your property and properly install it. Having professional help will ensure the system serves your property best and functions for the longest amount of time, with the least amount of hassle. A conventional gravity system uses the pull of gravity to transmit effluent through the pipes to the septic tank. The effluent enters the septic tank and the solid materials separate from the liquid. After separating, the solids sink and settle at the bottom of the tank, while the liquid flows out the opposite end leading to the drainfield. The drainfield is made up of pipes, carrying the water to gravel filled trenches covered by topsoil. Because this system requires gravity, the available depth level needs to be substantial and the terrain needs to be relatively level in order to insure proper sewage treatment. A pressure distribution septic system is usually used as an alternative when a conventional system (gravity system) is not an option because of depth restrictions. Instead of using gravity to disperse the effluent, the tank uses a pump that is time controlled or disperses the waste only when the tank is full. The pump transports the liquid into a shallow drainfield, which allows for a timely and equal distribution that controls the level of liquid. Because the system works with a pump there are controls and an alarm to alert you if the system is malfunctioning, all septic systems that include pumps will have these additions. A sand filter septic system is a solution when the location and soil conditions are not suitable for a conventional sewage system. This type of system includes not only a pump but also a sand filter that allows extra treatment of the effluent. As the wastewater goes through the tank and is pumped out, in a controlled amount, it then enters the sand filter. This is an extra step(pretreatment), which is sometimes needed, that treats the wastewater before it flows into the drainfield. Another benefit of a sand filter is that it’s not required to be installed below ground, which makes an above ground filter an option if space is limited. A mound septic system is an option when the conditions of soil will not allow for a standard drainfield, either the soil coverage is too thin, too dense, cannot properly filter the amount of water needing to flow though the system, or for locations that have a harsh environment. The effluent flows through the septic tank, to the pump which then doses the wastewater up into the mound. With this type of design, the mound is a hill created above ground level, in a designated area, that is packed with gravel and sand to filter the wastewater once more. Because the mound will need to be constructed, the cost of a mound system is usually higher than the cost of a system that uses a drainfield. An aerobic treatment system is not a typical type of sewage treatment system but it is an option when a conventional septic system is not feasible in the desired location. This design uses oxygen to break down the wastewater, unlike all the other septic systems which filter water by separation, sand or gravel. The effluent travels to the main section, called the aeration chamber. In this compartment air and the wastewater mixes together, bacteria then digests and aerates the effluent drastically reducing bacteria and harmful pathogens. This process actually pre-treats the effluent prior to contact with the soil and outside environment. All of these septic system designs use a natural process to treat waste. 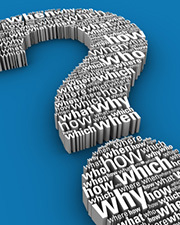 There are a lot of different aspects that need to be determined for proper compliance and operation. Call Custom Septic Inc., at (763) 218-4769 or fill out our Online Request Form. Our professionals have the knowledge, tools, and experience to ensure the correct sewage treatment system is installed based on your needs and location. For more information go to Minnesota Septic System Design Contractor, or click here.